You have read this article tutorials with the title September 2008. You can bookmark this page URL http://jenkrebs.blogspot.com/2008/09/things-to-make.html. Thanks! You have read this article quizzes / time-wasters with the title September 2008. You can bookmark this page URL http://jenkrebs.blogspot.com/2008/09/quiz-test-your-color-iq.html. Thanks! Once again, Yasmine at A Print A Day is offering some downloadable cuteness. You have read this article downloads / printable with the title September 2008. You can bookmark this page URL http://jenkrebs.blogspot.com/2008/09/printable-tags-and-list-pads.html. Thanks! And if you missed the first installment of How To Do Fancy Things To Your Blogger Template, click here. Thank you very much, Tips for New Bloggers. You have read this article tutorials with the title September 2008. You can bookmark this page URL http://jenkrebs.blogspot.com/2008/09/how-to-do-fancy-things-to-your-blogger.html. Thanks! A party idea with a downloadable, customizable invitation awaits you over at Hostess With The Mostess. Browse the recipe section over there, too. Yum. I want to make everything. You have read this article downloads / entertaining / invitations / printable with the title September 2008. You can bookmark this page URL http://jenkrebs.blogspot.com/2008/09/guest-post-at-hostess-with-mostess.html. Thanks! 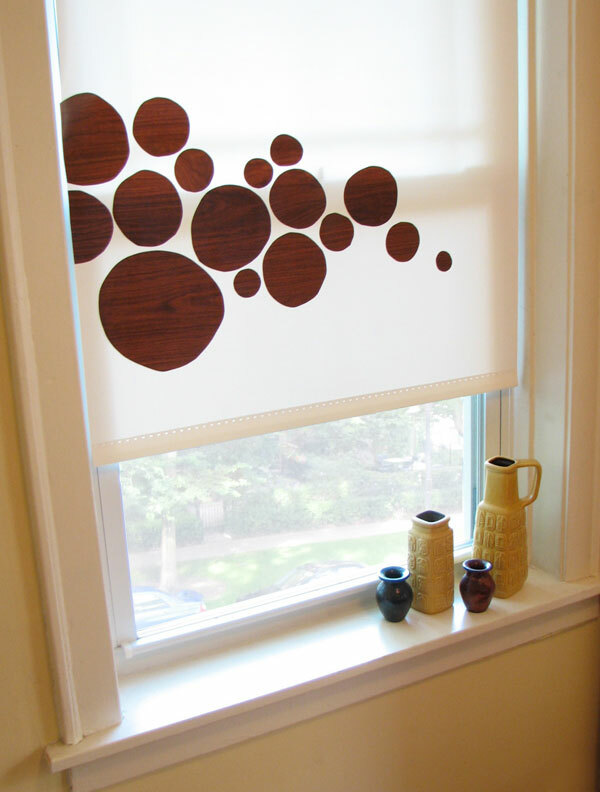 Here's an inexpensive, quick project for decorating plain window shades: contact paper decals. This vinyl shade was from Home Depot (they'll cut it to size for you if you bring along the dimensions of your window), and if I remember correctly, it was insanely cheap. Something like $5. To spiff it up, add cut contact paper shapes. I made some speedy faux bois circles here, but you could do anything. Some type? A shape from here? To make this, get some contact paper, available at Home Depot, Target, Amazon, hardware stores, etc. If you want something special and you've got a bigger budget, this place is a contact paper wonderland. Then either draw your design freehand on the back, trace it on with graphite paper, or use my lazy method below. Note that when you trace your design on the back, it will be reversed when you flip your contact paper over. So if this matters, you'd better flip your design first or trace it on the front of the contact paper. 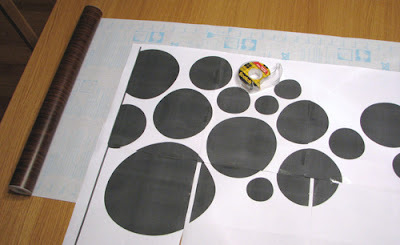 I made some circles in Illustrator, printed it out tiled, and taped the sheets together. Then I taped the design to the back of the contact paper and cut out the shapes. I just eye-balled where to stick them on the shade. If you accidentally stick something where you don't want it, you can reposition it if you slowly peel it up, but you have to be very careful. And after your shade bakes in the sun for awhile, I doubt you'll be able to remove the decals, so plan wisely! If you want the circle design I made, download the PDF here. It's tiled onto separate pages with a 1/2" overlap. You have read this article decorating / tutorials with the title September 2008. You can bookmark this page URL http://jenkrebs.blogspot.com/2008/09/diy-vinyl-shade-decals.html. Thanks! You have read this article downloads / graphic design / resources with the title September 2008. You can bookmark this page URL http://jenkrebs.blogspot.com/2008/09/download-free-ornaments.html. Thanks! You have read this article downloads / fabric / resources with the title September 2008. 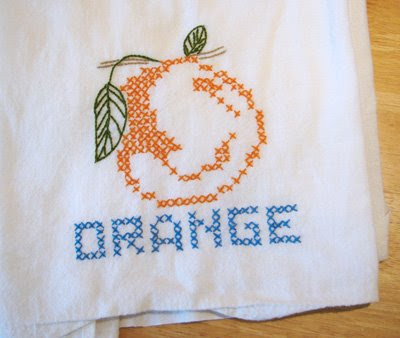 You can bookmark this page URL http://jenkrebs.blogspot.com/2008/09/free-vintage-embroidery-patterns.html. Thanks! 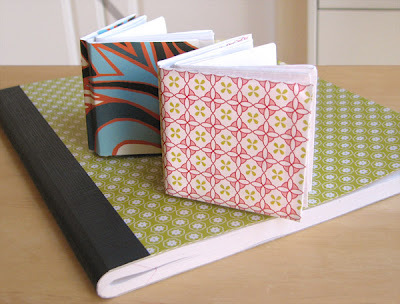 Another project from my Japanese origami book: mini books. I didn't do a perfect job, but they're so tiny and adorable, who cares? They're made from one rectangular piece of paper, folded many times. The finished booklet is about 2.5" square. I'm in awe of whoever designed this project. He or she is clearly a genius. Update: Check out this instructional YouTube video for an even tinier book! Thanks, Hoang! You have read this article origami / paper with the title September 2008. 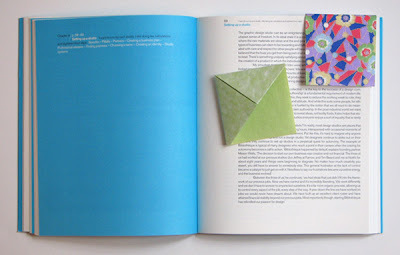 You can bookmark this page URL http://jenkrebs.blogspot.com/2008/09/origami-mini-books.html. Thanks! You have read this article shop with the title September 2008. You can bookmark this page URL http://jenkrebs.blogspot.com/2008/09/it-orange-and-awesome.html. Thanks! You have read this article origami / paper / tutorials with the title September 2008. You can bookmark this page URL http://jenkrebs.blogspot.com/2008/09/easy-origami-bookmarks.html. Thanks! I can't say I put much stock in astrology, but I was curious to know what color matches up with my birthday on Pantone's Colorstrology website. Turns out I'm "Fiery Red," which equals "Enterprising, Visionary, Leader." "You have come into this world to be a leader. You are active and lively and want to stand out and express your unique point of view. It is important for you to develop independence and to try new things. You are innovative and enterprising and have the ability to manifest your will if you stay centered." Hmm, I'm not sure I'm as ambitious as all that, but it's something to strive for. Do your day's description and color fit you? You have read this article time-wasters with the title September 2008. You can bookmark this page URL http://jenkrebs.blogspot.com/2008/09/what-color-are-you.html. Thanks! I've received many emails asking how to learn to sew. Silly people, don't you know I'm not very good at it? But I can tell you how I got started and maybe point you in the right direction. My husband got me a Singer 7462 for Christmas a couple years ago after I told him I didn't want a sewing machine. I figured it would sit in a corner unused and make me feel guilty every time I saw it. But he got me one anyway because he loves me and knows me better than I know myself. Sure enough, it was one of the best presents ever, even though it makes me want to shoot myself sometimes. Which is why you won't believe me when I say this model is very simple to operate. I have no complaints about it except that the light on it is quite dim. You'll either need to wear a miner's headlamp or drag a lamp over next to you. Other than that, it's fabulous. My machine came from a fabric store down the street, and free lessons were included. If you buy from a local store, see if they offer some beginning lessons. A nice lady met with me four times to teach me how to get started. Very helpful. 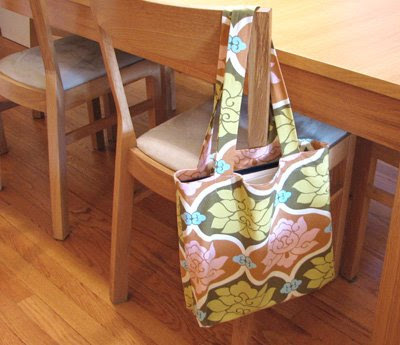 I've since forgotten everything she said, but it gave me enough confidence to make my first project by myself: that bag in the picture above, made from this tutorial. I was bursting with pride because it actually looks like a bag! The Complete Photo Guide to Sewing is a very useful but ugly sewing book that's helped me a lot. And good news. They're finally updating it, due out in January. It tells you all the types of seams and what they're for, how to put in a zipper, make a pillow, plus scads of other projects. It's better than a website because you'll need to refer to it constantly while you're doing a project. If you want a really pretty, inspirational book, get Amy Butler's In Stitches. Not as useful for the basics, but much nicer to look at, with cool project ideas. Hopefully that's helpful to someone out there. Really, you should sew. You will like it most of the time. You have read this article fabric / resources / sewing with the title September 2008. You can bookmark this page URL http://jenkrebs.blogspot.com/2008/09/how-i-started-sewing.html. Thanks! 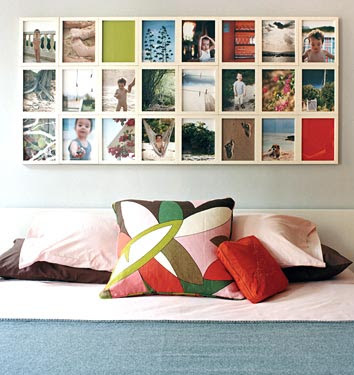 Domino has a gallery of ideas for displaying family photographs. Here's my favorite: picture frames duct-taped together to make one big piece of art. 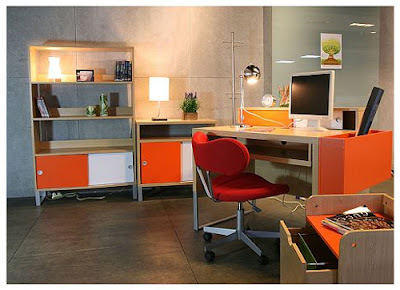 See how they added solid color blocks and nature shots to balance the people-pictures. Love it! You could use something like these cheapies from IKEA, I bet. And speaking of IKEA, I'm reminded of this cartoon. Heh heh. You have read this article decorating with the title September 2008. You can bookmark this page URL http://jenkrebs.blogspot.com/2008/09/displaying-family-photos.html. Thanks! 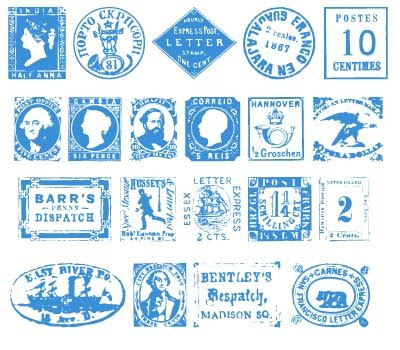 Download this postage font from dafont.com. Spotted by Luzel over at iDIY. You have read this article downloads / fonts / graphic design with the title September 2008. You can bookmark this page URL http://jenkrebs.blogspot.com/2008/09/free-postage-stamp-font.html. Thanks! I found this $3 ice bucket at a thrift store and reupholstered it with a piece of the strike-off for my new Boardwalk fabric. 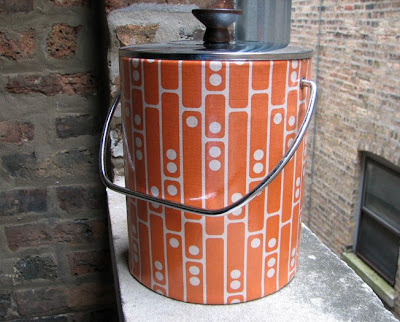 Granted, I'm not really sure how often I'll be needing an ice bucket, but I was captivated by its vintage grooviness. And I can always use it as a storage container in my office. I think this one on etsy might be identical, except it's got brass-colored hardware. If it's like mine, you can completely pry the parts off and wrap it with new fabric. I ironed vinyl onto mine to make it waterproof. You have read this article fabric / favorite things with the title September 2008. You can bookmark this page URL http://jenkrebs.blogspot.com/2008/09/a-nice-bucket.html. Thanks! This library contains a wealth of historic images, scanned and cleaned up by Florida's Educational Technology Clearinghouse. Teachers and students can use up to 50 items in a single, non-commercial project without further permission. You might find some inspiration here for some of your own art projects. You have read this article graphic design / resources with the title September 2008. You can bookmark this page URL http://jenkrebs.blogspot.com/2008/09/clipart-library.html. Thanks! You have read this article tutorials with the title September 2008. 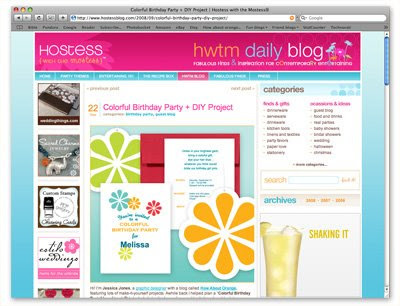 You can bookmark this page URL http://jenkrebs.blogspot.com/2008/09/a-handful-of-craft-tutorials.html. Thanks! I bought these gold plastic frames (below) at a thrift store and gave them a few coats of spray paint. They were, um, stunning before, but everything is better in orange. Try it—spray painting is fun! Just make sure you get spray paint that's formulated for the type of surface you're painting. Apply several light coats of paint, waiting about 30 seconds in between. Your project will be dry in about 10 minutes, and set in an hour. I used Krylon Fusion for Plastic, purchased at our local Ace Hardware. Now I just need to make some kind of pictures to frame with these. Then I'm off to take a bath in a giant flower. You have read this article tutorials with the title September 2008. 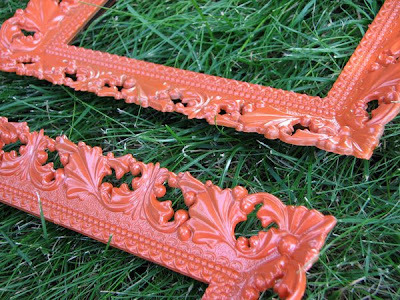 You can bookmark this page URL http://jenkrebs.blogspot.com/2008/09/spray-painted-picture-frames.html. Thanks!